You can send one visitor to multiple businesses at the same time and be paid by all these advertisers at once. It works like this... Your visitor requests information or a quote, by completing a referral form. They are then presented with a list, or directory of companies, that have received their request and will be providing them with the information or quote. The company that gives the visitor the best info or price gets their business. You can have as many referrals companies as you want. You can even charge different rates for each referral company. An email is sent to all companies in real time, and another email is sent to the visitor with all the company names and their contact information. You can also send an email to yourself telling you that you just made money! If you already have a website or blog you can use Income Activator's Referral software as an add-on, and run your own revenue stream sending leads to advertisers, when you register for a website. The reason Directory Referrals are such a profitable revenue stream is that it takes very few visitors to make a lot of money. For example, you can send one visitor lead to 10 companies to quote. If all advertisers pay $10 each for the opportunity to bid for the visitor's business, one lead earns the website owner $100. This Directory Referral website send leads to painting contractors when a visitor describes the painting job they want quoted. When the visitor enters their description of the painting job, and clicks on the submit button, they’re shown a list of painters and their contact information. or nutritionist. Start $10 per lead. Any company that bids on jobs, offers quotes, or competes for projects would love for a chance to bid in your directory program. This referral model that generate leads for companies is perfect for contractors, graphic designers, rental companies, photographers, interior designers, and so forth. 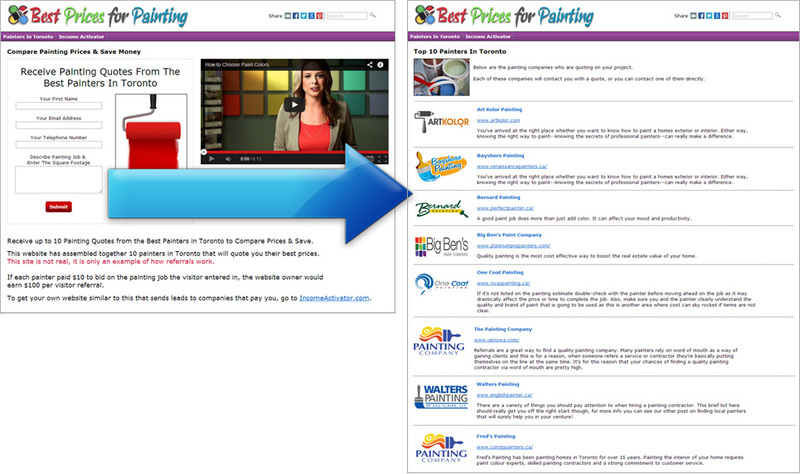 These advertisers are probably already using Google AdSense to get visitor traffic, and could be paying $5 per click. A person completing a referral form is worth double what a click is worth. An ad in a newspaper can cost the advertiser $1,000’s of dollars, a radio ad can double that, and a TV ad can triple that, all with absolutely no guarantee of a lead. Yet companies keep paying for this type of advertising. These companies have sales budgets and they need to spend them. Getting the opportunity handed to you to quote on a job is the best advertising a company can buy!